I am a strong believer of the tacos and the salsas. There cannot be too many tacos or salsas, ever, in my life. I mean seriously. Fresh, healthy, lean, sat-is-fy-ing. I love this pineapple mango salsa for more than just the taco recipes however! This pineapple mango salsa recipe is the perfect combination of sweet and savory. Let’s talk about how to make it. Chopping is like therapy to me. But it has to be with a big ol’ Chef’s knife. The best way to cut these ingredients, especially the pineapple with its thick outer core is with a sharp knife. Chop all ingredients really small. Since the pineapple is the star of this dish I highly recommend you do not use canned pineapple. Using real fresh pineapple will make all the difference. Cutting mango is really simple, once you have discover how to do it! Standing the the mango with its stem up cut down the two sides that are long. taking the large circular pieces cut into them in a grid like fashion, cut only as dip to the skin, do not cut through the skin. 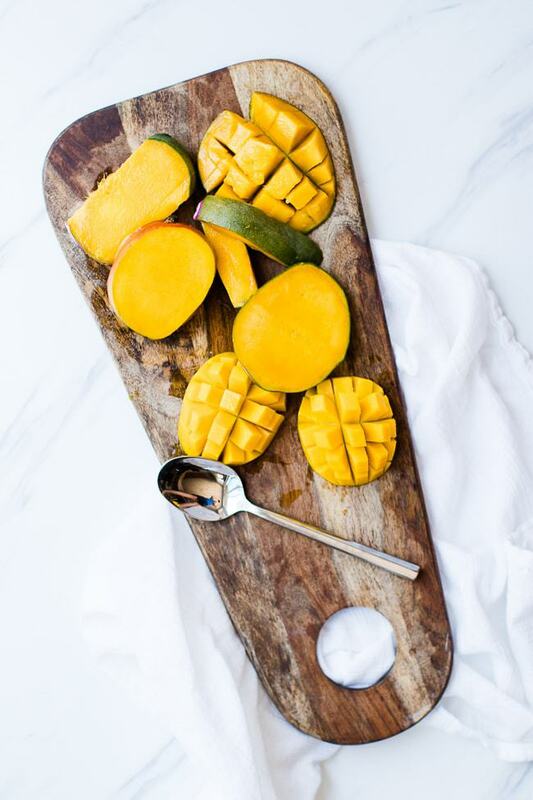 Using a large spoon scoop out the mango- it will be perfectly chopped for you! How you do you know when a mango is ripe? A mango is best when it is soft and a firm tender, but not mushy. What meals do I serve this with? This pineapple salsa is so delicious you can serve it as an appetizer with your favorite tortilla chips. But if you are thinking of spicing up a few of your meals try it with these instant pot Carnitas. It also is the perfect topping with this Lemon Lime Chicken! Sweet and savory pineapple mango salsa is the perfect addition to so many meals! For meats, tacos or with chips! Easy to make and so fresh & healthy. Combine together, let sit at room temperature for a few hours so the flavors can merry. Both my husband and I love pineapple, and while we have a mango salsa that we both enjoy we have never tried pineapple in it! Definitely trying this!